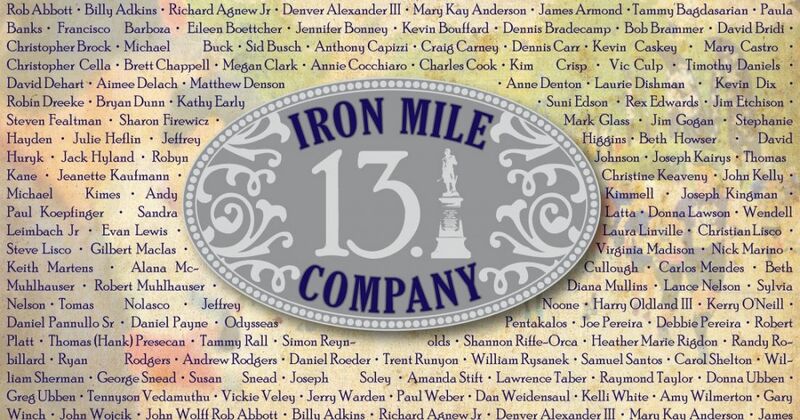 A select group of 135 runners have earned the honor and distinction of membership in the exclusive Iron Mile Company. This group consists of individuals who have participated in every Historic Half since the inaugural running in 2008. The name “Iron Mile Company” is a nod to the history of the greater Fredericksburg area. Nearby Spotsylvania was a frontier outpost named for Alexander Spotswood, Colonial Governor of Virginia. Spotswood founded a mining and smelting operation called the Iron Mines Company in 1725. The Iron Mines Company utilized the Rappahannock River as a key shipping channel and developed a road network to transport iron. Like the steely fortitude of the iron mined in Spotsylvania, Iron Mile Company members have shown dedication to the Historic Half. Almost 40 of these runners are from Fredericksburg. The range of ages of the Iron Mile Company members spans from 20 to 72 years.